Argon Design, a leading developer of high-performance software for multi-core processors, introduced a flow simulation tool based on Netronome's flow processors. 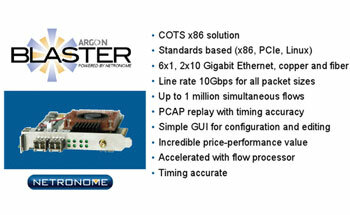 The Argon Blaster, which leverages a Netronome Flow Engine PCIe acceleration card, generates realistic, Internet scale traffic loads and applications to test networking and security equipment. The PCIe acceleration card runs in standard x86 platforms and delivers line-rate, timing-accurate packets for traffic flow simulation. Argon Design said its Blaster is capable of saturating a 10 Gbps link with application traffic with accurate, consistent, per-flow rate control for up to a million unique flows. Blaster pricing starts at $9,999, including 12-month warranty and customer support. Cisco agreed to acquire Meraki, a rival supplier of campus Wi-Fi solutions, for approximately $1.2 billion in cash and retention-based incentives. Meraki supplies a line of high capacity on-site WLAN hardware that is centrally managed from its cloud. Compared to other WLAN solutions including Cisco's own campus Wi-Fi, Meraki has said its key advantages are quick turn-up and no training or dedicated staff needed to maintain the network, thus reducing the total cost of ownership. Because it leverages cloud-based management, the feature set is constantly updated and secured. There is no centralized controller. User traffic does not pass through the cloud. The network continues to function even if the connection to the cloud is broken, however Meraki hosts its management platform in multiple data centers across the country and provides a 99.99% uptime SLA. One customer example is Accor North America, which is using Meraki to managed Wi-Fi service to 70,000 hotel rooms in 620 properties across the U.S. The network is managed no dedicated staff from Accor. 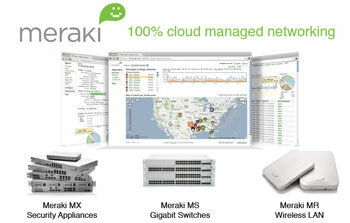 Meraki's product suite includes a line of indoor/outdoor 802.11n access points with 802.3af Power over Ethernet and mesh capabilities, a line of cloud-managed security appliances scaling from small company versions to large campus models, and four cloud managed Ethernet access switches featuring built-in monitoring and Gigabit of 10G uplinks. Earlier this year, Meraki introduced Layer 7 application visibility controls into its Wi-Fi switches. This provides insight into how much traffic is due to YouTube, Netflix, Vimeo, etc. Meraki was founded in 2006 and is based in San Francisco. Cisco said that acquisition of Meraki's cloud networking solutions will expand its own portfolio by providing scalable solutions for midmarket businesses. "The acquisition of Meraki enables Cisco to make simple, secure, cloud managed networks available to our global customer base of mid-sized businesses and enterprises. These companies have the same IT needs as larger organizations, but without the resources to integrate complex IT solutions," said Rob Soderbery, senior vice president, Cisco Enterprise Networking Group. "Meraki's solution was built from the ground up optimized for cloud, with tremendous scale, and is already in use by thousands of customers to manage hundreds of thousands of devices." * ThinkSmart Technologies was a software developer specializing in location data analysis using Wi-Fi. Financial terms were not disclosed. ThinkSmart’s location analytics collects information on movement within a venue including time of day, traffic patterns and dwell times. The company, which is based in Cork, Ireland, was formed at the Incubation Centre of University College Cork. Zayo reported quarterly revenue of $229.7 million, a $120.1 million sequential quarter increase largely attributed to the acquisition of AboveNet, and adjusted EBITDA of $122.6 million, which was $65.1 million higher than the prior quarter. There was a loss from continuing operations of $53.4 million for the quarter, $48.2 million higher than the $5.3 million net loss for the previous quarter. The company said it continues to add buildings on-net and expand the number of fiber route miles both through acquisitions and new construction. Zayo's 8K SEC filing also contains lots of interesting data on operational metrics and pricing trends for key services, including monthly recurring pricing trends for 10G wavelengths, 2.5 G wavelengths, 1G wavelengths, 1G Ethernet, Fractional 1G Ethernet, Fast Ethernet, OC3, OC12, OC48, DS1 and DS3 services. In September, Zayo completed its previously announced acquisition of FiberGate, which delivers dark fiber connectivity in the Washington, D.C. metro area. The acquisition adds 399 new route miles and 130,000 fiber miles in Washington, D.C., Northern Virginia, Baltimore, and suburban Maryland to Zayo’s network. In September, Zayo agreed to acquire First Telecom Services, which operates a fiber network across the northeastern and midwestern United States, for $110 million.